Most of us have known people with braces. After all, metal braces are a pretty obvious feature. If a braces-wearer so much as grins, you can easily see those shiny wires and brackets. While braces are certainly useful for bringing the teeth and bite into correct alignment, they can be stigmatizing and uncomfortable. The Invisalign aligner system eliminates these problems while providing excellent orthodontic correction and convenience. 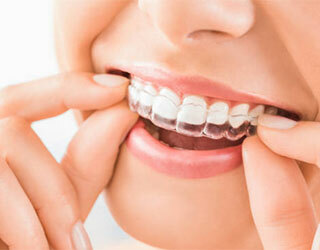 Invisalign aligners are totally transparent, so no one can tell you are wearing one. What’s more, Invisalign is removable for eating or sports – no more spinach stuck in your braces. You will receive a new aligner every week or so as your teeth gradually move into the appropriate position. In no time at all, you will be enjoying a new, straight smile. To learn more about Invisalign and how Dr. Shin can help you with orthodontic correction, please call us at (203) 625-0301.